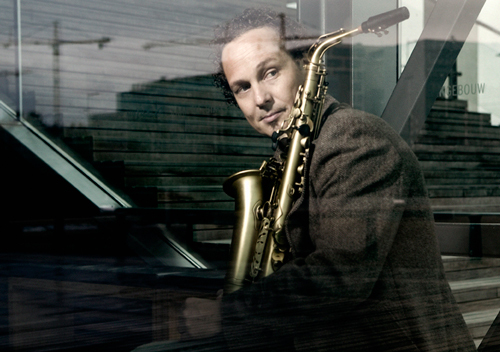 Olaf Zwetsloot is an Amsterdam-based saxophonist, composer and producer with a unique, lyrical voice. In 1997, together with rapper Def P. and poet Serge van Duijnhoven, he initiated ‘Last Stop Ghost Town’ (‘Eindhalte Fantoomstad’, Djax Records). This project combined hiphop, jazz, electronic music, spoken word and poetry. A year later, Olaf won the Jazz Prize of the City of Dordrecht with a masterful arrangement of Thelonius Monk’s Epistrophy in 7/8, resulting in the CD ‘Deep Syntax’ (A-Records, 1998). This album contained only original compositions, except for Epistrophy, and it earned the band an invitation to perform at the North Sea Jazz Festival. Olaf also played with pianist Konrad Koselleck and classical singer Henry Muldrow, combining poetry, classical music and improvisation. Due to an injury, Olaf stopped playing for seven years and embarked on a successful career as a copywriter in advertising. The release of his album Quantasia (Hipcescu, 2009), an amalgam of be-bop, post-bop and m-base funk, marks his comeback as a performing musician. Currently, Olaf gigs around with various bands. Most notably his quartet, a group that comprises such top-notch musicians as Clarence Becton, Timothy Segond von Banchet and Thomas Winther Andersen. Besides that, Olaf has played with a host of people and groups, yugo rock star Rambo Amadeus, Victor de Boo, Dirk Balthaus, Cord Heineking, Ferial Karamat Ali, Pablo Nahar and Jah6.